I have always felt disadvantaged by not having a cause for which I can claim to be an activist. I’ve always wondered where that college or university is that hands out those degrees in “activism” or “human rights-ism” that so many who own computers seem to claim. Well, thanks to the Washington Post, Scotland moves toward vote on independence, I’ve found a cause I can support as an activist – freedom from the British occupation of Scotland. I can activize for the poor Scots – a small, much maligned group, even though some have been infiltrated by foreign elements such as the Palestinian Solidarity Campaign (Scotland) and the City Council of down-trodden little towns like Dumbarton which are more concerned about the Arabs on the West Bank than the centuries-long suffering of the Scots under the British jackboot, to use a phrase culled one from the Guardian’s one-time favorite contributors. 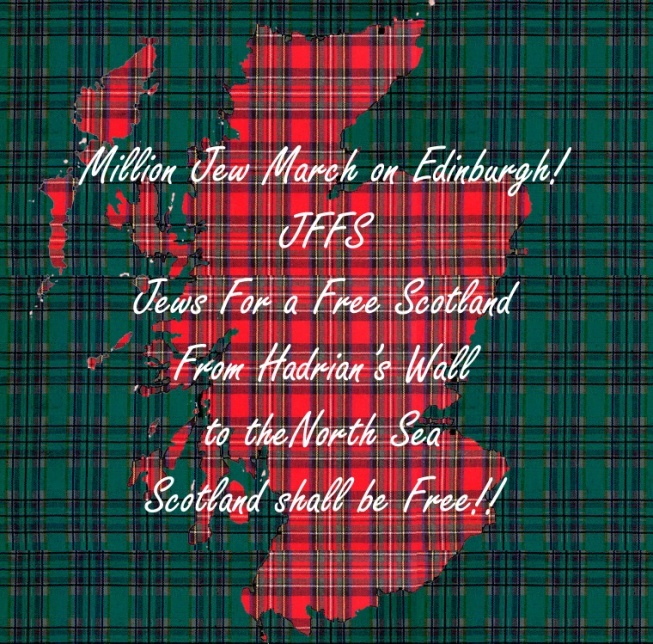 Actually, not only am I supporting the cause – I have created my own movement – Jews For a Free Scotland, aka JFFS. I originally thought the pool from which I want to draw my activist support would be more clearly understood if I called my movement JewsFFS but I know there are the cruder minds who might misinterpret the last three letters, so had to go for the briefer JFFS. Such is life in the world of NGO acronymology. However, as a benefit, JFFS is short and the “J” is probably clear to all activists and human rights people. No-one would misinterpret “IJV” as “Idiotic Jewish Voices” just because that group of three or four liberal Jews wants to destroy Israel. (In case, like most people who can’t find Israel on a map, you do not know where Scotland is, it’s the shown here as the reddish tartan area on the background of a green tartan sea at the top of England. It’s been occupied by Britain since about the time of Edward the Confessor, though formally incorporated in 1707. England insists on showing it on a map from La Manche to the Scandinavian Sea as part of what Queen Anne of Scotland referred to as the one-state solution. There are also enclaves of occupied Welsh and Irish people crammed into two of the world’s largest and miserably wet open-air prisons to the West of England). We (well, I, at this time) encourage Scots of all clans and faiths, to join our (well, my) Million Jew March on Edinburgh (MJME). We are a democratic movement open to all activists and human rights organizers who are dedicated to the overthrow of the British occupation of Scotland and who feel the Scots, like the Jews, deserve a state of their own. I specially call on liberal British Jews such as the Roses, the Klugs, Tony Lerman, Jonathan Freedland, etc. for support and contributions (monetary) for the MJME. The movement is also open to groups such as “Scottish Jews For A Just Peace”, (SJJP – yes, you know what one of the “J”s stands for!) since “as-Jews” they should extend their support from merely supporting remote Palestinian causes (“Jewish opinions critical of Israeli policy to be heard in Scotland”) to supporting a movement focused on an occupation closer to home: “Jewish opinions critical of British policy to be heard in Scotland”. Hopefully, numerous two or three-man (and women) Jewish groups who spend so much time worrying about how to destroy Israel and promoting a Million Man March on Jerusalem as their major concern will be able to spare a little thought for those suffering so close to their own homes in Scotland, Hampstead, Oxford, and Cambridge and how to destroy the United Kingdom and join the Million Jew March on Edinburgh. We (I) draw inspiration from the words of “Scotland-Firster” Alistair Hunter, a 54-year-old nationalist working for the city of Edinburgh quoted in the Washington Post. From Hadrian’s Wall to the North Sea – Scotland Shall be Free! Absolutely, we real Englishmen have never wanted those barbarians north of the Watford Gap anyways. Its the same with the frenchies south of the Thames, we could do without them as well. Not to forget the Taffs and the Paddys somewhere off to the west 😉 Doesnt leave much England I know but we could always up and leave I suppose, I´m sure our friends in saudi arabia have plenty of space for a few million refugees, dont they? Nice joke, but Hadrian’s wall is actually in England and the North Sea is that wet bit on the map to the east of Northumberland (the English county north of the wall). So ‘From Hadrian’s Wall to the North Sea’ is basically. . . meaningless. From Gretna Green to John O’Groats might do. A footnote to the site: there’s also a vernacular history of Jews having fled to Scotland after the expulsion from England. That is your tartan tallit, AKUS. I hadn’t read so far down your post before I posted. Laughing too much. We welcome Jews of all tartans to the movement! Interesting to note that Scottish Jews have no interest in immigrating in Israel and prefer to remain proud citizens of modern Europe. It’s a community of less than seven thousand, however aliyah does take place. There was the amazing example of overwhelmingly great humanity when a young Scottish Jew was murdered in Israel by the terrorists “Hannah” is in thrall to. And please let that stand as the empty chair in the midst of our having fun for once. Let’s not quibble here Tom. He could change the slogan to From Hadrian’s Wall to John O’Groats but as it is, it reverberates nicely. Well done Akus! You had me chortling away at my desk. It’s nice to get a bit of light relief, and even to imagine that your new movement might yet take off. Hmm, I see your point. Annexation by Scotland would lead to occupation all over again, in the other direction. We have a conundrum within a quandary. I know. Let’s call in the UN! That’ll help! If it was Hadrian’s Wall to John O’Groats he’d be annexing Northumberland, which is English. i.e. far more apt when it comes to calls for “from the river to the sea” – whether from Palestinians or indeed Israelis. AKUS in your attempt at humour you are demonstrating a high degree of ignorance not only of the geography of where Wales and Ireland are, but an even higher degree of ignorance about Wales and Ireland. Neither are, in your words, miserable or wet or open-air prisons. Perhaps I should remind you that Wales is the same size as Israel, that Wales has a history that goes back millenia and of course a language and culture that also stretches back centuries and is as good as any and better than a lot. Your descriptions of Wales and Ireland as quoted above are not only ignorant but also offensive to two great Celtic nations. An apology is in order, or do you really want to wake up in the morning with a Dragons head at the bottom of your bed? How about: Jews for a Free Ireland, Free Falklands ect ect. It works better when it’s correct! Jews for a free Gibraltar! Jews for a free Perejil! And Free East Sesame Street! Down with Kermit the Zionist frog! Malvinas, Maldives, I got ’em mixed up. And, last, but not least, Free Saint Helena ( the island, I mean)! Yes. Check the wiki site. Maybe Mel Gibson should be imprisoned there. And many others. Only if they’ve kept the wallpaper. Just the other day I was talking about how my Latvian Jewish ancestors settled in Glasgow during the 19th century. Tell us more. One of my contacts on Usenet a few years ago said his grandparents settled in a Gaelic-speaking island and managed quite well because of their knowledge of Hebrew. And having a gift for languages? During the 19th century there was a significant flow of Jewish immigrants from the western part of the Russian Empire (especially from the Baltic) into Scotland. Mostly settling in the Gorbals neighborhood of Glasgow. That’s really all I know. Consequently, my great-grandfather was a fluent English-speaker prior to his arrival in America in the 1890s. That´s why they´re know as “the Gorba(l)chovs”. The continuing narrative of how the Jews occupied Scotland! Sean Connery should be the next king of Scotland. King Bond, James Bond the First. Yes! But he’d have to go back then and maybe learn how to pronounce /s/. The first aim of JFFS must surely be the dismantling of the Apartheid Wall, which the occupiers refer to as “Hadrian’s Wall”. Never has there been a more ugly symbol of oppression and racism than this wicked barrier built between peoples to imprison the noble free Scots. The claims of the “English” and the imperialist Romans who funded the persecution of the Scots for centuries that it was constructed as a “defensive barrier” against the lawless, vicious Celtic tribes is an offence to the peace-loving people of Scotland that has stood for centuries. It is simply racism ato oppress an entire nation of people because of the unfotunate, though understandable, behaviour of a few drunken Rangers fans. When will the Anglican Entity realise that a few headbutts on Anglican setters in Glasgow are merely the acts of desperate men who have been deprived of their traditional cultural pleasures such as deep-fried Mars bars due to the nazi health & safety brigade who are desperately trying to Anglicise Scotland and erase all evidence of Scottish culture such as a life expectancy of 33 and rampant morbid obesity. Someone who has never heard of Hunter, Lister and Fleming, never mind Robert Burns. Wherever did they get the idea of getting a Foul-mouthed, drunken, racist to play a Scotsman? Gibson is more of a Chickenheart. Confirmed: lack of sense of humour. Of course I have (well, most of them – who is Hunter? ), but I was (as I’m sure you know) exaggerating to enhance the absurdity of the argument and, by association, the parralel arguments put by “anti-Zionists” about the I/P issue. “The Zionist Movement views with favour the establishment in Scotland of a national home for the Scottish people, and will use their best endeavours to facilitate the achievement of this object, it being clearly understood that nothing shall be done which may prejudice the civil and religious rights of existing non-Scottish communities in Scotland, or the rights and political status enjoyed by Scots in any other country”. While I applaud your effort, I must say that it does not go nearly far enough. Your vision for Scotland appears to involve leaving sixty-two percent of the ancestral Celtic homeland in the control of the illegitimate colonialist entity known as ‘England’. It is a well-known fact that the ‘English’ have no historical connection to Britain, and, in fact, only began to colonize the region in the late nineteenth century, with support from the United States, and European colonialist powers. An independent Scotland, with the majority of its land still under foreign control is intolerable, and JPCF (Jews for Pan-Celtic Freedom) can not accept this revisionist, colonialist, racist, and uniquely intolerable oppression. But we might march with you, depending on how we feel. We will, of course, expect you to laugh at anyone who suggests that our goal is the destruction of England as a nation. I also note that pseudo-progressive Tom Foster appears to feel that we will accept his preposterous claim to Northumberland (which should properly be known by its true Celtic name, which was in use up until very, very recently, but because of English oppression I’ve forgotten what it was), if he cynically signs on to an oppressive and ultimately genocidal two-state solution. JPCF will not tolerate this kind of racism! Forget Northumberland – after further thought I’ve decided to campaign for the restoration of the Kingdom of Northumbria, which, as a glance at any relevant historical map will show, included a large chunk of what is now laughingly and insultingly known as ‘Scotland’. So stop oppressing me and give it back now. I´m feeling kinda oppressed right now. Can I apply for some EU money? Ah, come on. That’s an unnecessary and nasty dig at the Scots. When will there be an end to your witch-hunting? It was just a little joke – and nothing personal against SerJew. Chill out for god’s sake. No sense of humour? Scoff? I had a beautiful image of a Pict about 4 computers ago. You show us you in your body art, SerJew! What about the Hicsos? And are there Picts of Hiccups? I’m not sure I understand the question. The Picts are the indigenous people of Scotland. All Scots (indigenous Scots, not English settlers), are Picts. Any suggestion that the modern population of Occupied Scotland is different in any way from the indigenous population of Britain, as it has existed from before Stonehenge was raised is both revisionist and racist. Most people talking about Picts sound like that. But they haven’t made it to The Groan. Picts are thought not to be Celts. Unless they were Celts. But my pic of a Pict was amazing. What abou the “Knights who say Ni”? They are pretty oppressed, methinks. Ooh, this is great! Though I prefer the analogy-spoof of having the Turks call themselves “Greeks” and speak of “Hellenic colonialism,” this is just as fitting! Akus if it’s not something I should have known about, why he bicycle riders? What’s the reference to the bicycle riders about? Is this an inside JFFS joke? See above – remember the old joke about the Czar asking who to blame, and the Jew telling him to blame the bicycle riders? Why the bicycle riders??? Why the Jews?! You should see what goes on at the Scots Hotel in Tiberias on Burns Night! My son has just told me that the reference should be to the Antonine Wall, noit Hadrian’s Wall. Of course, Tom might differ..
Is my movement falling apart in its infancy due to schismatic differences of opinion over minor details like an ancient wall? That’s a bit too far north, Gretna is the place the English had to run as far as to get married young, Young being 16. Berwick-on-Tweed (to the east) could be compared to Gaza, England has it currently but it has changed hands a few times. No Hamas but it probably has some infestation of SPSC. Are you referring to the pre-1967 Gretna Green(line)? It was pointed out to me years ago that Israel’s Green Line shows up as just that on satellite pictures. The green ended there. It probably was as far as someone was concerned. I love the “Camelon” name in the area. It’s a contender for Camelot though the English think that’s Glastonbury. I thought Tintagel in Cornwall was Camelot? Another contender. There must be more. As long as we all agree to consider our cause the most important one in the world today, I don’t think the details, or facts for that matter, should slow us down at all. There are some very strange comments re Scotland here, stemming from a misunderstanding of the main issues. For the record, I’m a Scot living in Scotland. I’m a member of the Scottish National Party (SNP), and my family background is Presbyterian, although I don’t follow any faith. So, some historical facts: Scotland evolved as we know it today in the 9th and 10th Centuries from the Picts, Gaels, Norse, Britons and Angles. It remained an independent country until the Treaty of Union with England in 1707, albeit, we endured periods of invasion and, at times, occupation by English armies, particularly in the 1290s and early 14th Century. Our King James VI became king of England and Ireland in 1603, after the death of Elizabeth of England, though Scotland remained technically an independent nation until 1707. James decided to move to London to rule his three kingdoms. Scotland has never been entirely comfortable in Union with England, but our issues are with the UK parliament in London and not the English people. We are not under any sort of military jackboot, and we all have the vote. If there is any form of oppression, it is of the cultural and economic variety, but this only happens because we allow it. This subservient attitude is largely the result of British propaganda by the media. Currently, the BBC in Scotland is the main opposition to independence, while all the newspapers are either Unionist or foreign-owned. In essence, all our broadcasting is controlled from London, which gives them an advantage in the information war. Re the economy, Scotland has always been portrayed as too poor to survive. London describes us as “subsidy junkies”, claiming that the English tax-payer subsidises Scotland. The truth is quite different! Scotland is a very wealthy country. Current UK Government figures actually show that last year Scotland raised 9.6% of UK revenue with only 8.4% of the population, while receiving 9.3% of UK expenditure. Unfortunately, this is where the London-controlled media has influence. The truth is masked at every opportunity. Consequently, there are still many Scots that think we can’t survive because we are too poor. If you tell a lie often enough, people will believe it. If Scotland is a drain on the English tax-payer, why would PM David Cameron say that he would “strain every fibre of his being” to keep the UK together? The SNP, the main party of independence in Scotland, is currently in government in the Scottish Parliament in Edinburgh, after winning the last two Scottish elections. The Scottish Parliament is responsible for the majority of Scottish affairs, but the economy, the military and foreign affairs are still controlled from the UK Parliament in London. With the SNP in government, we now have the opportunity to vote in a referendum, which will be held in the autumn of 2014. The next two years will determine the result of this referendum, and, ultimately, the future of the United Kingdom. If Scotland votes to end the Treaty of Union, the assets of the United Kingdom will be negotiated on a proportional share. For example, the UK armed forces and UK government infrastructure including real estate assets built for and funded by the people of the UK. It’s a little like splitting the assets of a marriage on a divorce. Despite the antagonism emanting from London’s media, the dissolution of the UK doesn’t need to be hostile. We share many cultural ties, and you’d find it difficult to find a Scot that doesn’t have relatives in England. It is a myth to say that the Scots hate the English. I have many English friends living in Scotland, and many Scottish relatives living in England. I served in the UK Armed Forces, side-by-side with people from all over the British Isles. The crux of the matter doesn’t come down to ethnicity; it comes down to self-determination. Simply, we want to run our own affairs from our own capital city, just the same as most other nations in the world. A note on the SNP: We are a modern, progressive left-of-centre social democratic party, with an eye on the Scandinavian social models of government. It is not an anti-English party. We have many English members, activists and representatives who have made Scotland their home. We also have members, activists and representatives from all over the world and from all of Scotland’s ethnic groups. Ours is a nationalism based on civic lines and has nothing to do with ethnicity. We stand for all the PEOPLE of Scotland. We welcome the support of the International Community, but equally, we would rather it was based on the facts and not any misty-eyed mythology, ie. The Braveheart image, and while tartan is an iconic Scottish brand, we are much more than that. Scots have contributed so much to the world: television, telephone, radar, penicillin, ATMs, to name a few, and our universities produce more research papers than any other country. We have an abundance of renewable energy resources, while there is at least £1.5 trillion of oil and gas in Scottish waters. Our oil industry provides 25% of the UK’s corporation taxes. Our whisky industry is the UK’s biggest food and drink exporter. We also have an inordinate supply of fresh water. Edinburgh is the fourth largest financial centre in Europe, and our tourist, manufacturing and bio-research sectors are flourishing. We are already successful. What we need now is to control our own future, but that will be up to the Scottish electorate in the autum of 2014. I believe, firmly, that they will choose self-determination. Richard. This was a light-hearted chat. I don’t think anyone was making any serious comment about Scottish history, politics or the legitimacy of the movement for Scottish independence. The point was to highlight, by use of an exaggerated and clearly fictitious call to action, how strange it is that so many in Britain (and elsewhere) seem moved to march, demonstrate, boycott etc on the Palestinian issue when it essentially has nothing to do with them and they have dangerously little or one-sided information on the topic.